The celebration of summer solstice on June 21, when the sun rises before 5 a.m. in the northern hemisphere, marks a sacred tradition in Ireland dating back 5000 years, when the power of the sun is celebrated at the burial places of ancient gods, since pre-Christian times. Ireland has a number of megalithic monuments. Well-known sites such as the passage tomb called the Mound of the Hostages at the Hill of Tara, and Newgrange, which features stone carvings dating back to 3000 B.C., draw hundreds of visitors, especially for Winter Solstice on December 21, when the ancient passage tombs capture the rising sun. Less famous, but also spectacular are the Carrowkeel Cairns passage tombs in County Sligo, which for about a month before and after the summer solstice, captures the sunset. 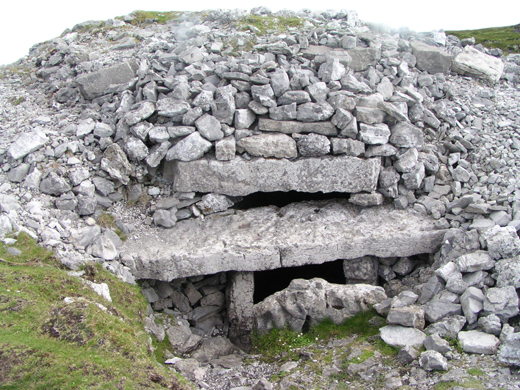 The Carrowkeel Cairns (the word cairn, taken from the Irish, means “a pile of stones used as a memorial”) is made up of a total of 14 passage tombs. Built on the Bricklieve Mountains (from the Irish breac sliabh, meaning “speckled mountain,” after the limestone that composes them). 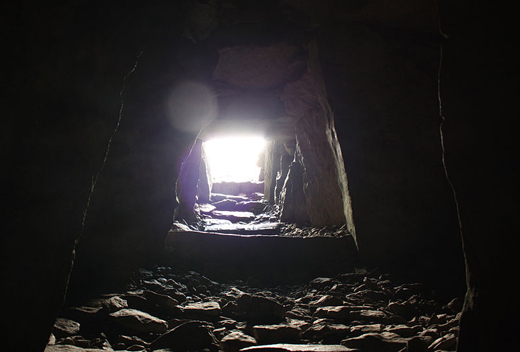 The structure named Cairn G resembles Newgrange’s passage tomb most closely. It similarly houses a cross-shaped arrangement of chambers (the three on the side intersect at the main) sheltering ancient remains, and demonstrates an early mastery of the architectural technique of corbelling – the layering and distribution of stones to create a sturdy ceiling at a desired height. By far, however, the most significant shared feature is the roofbox structure takes in sunlight and disperses it in a controlled pattern within the larger cell of the monument. Carrowkeel’s and Newgrange’s are the sole two roofboxes in documentation, which only serves to make each other’s existence more curious. While the inner chamber of Newgrange sanctifies the shortest day of the year, Carrowkeel’s Cairn G showcases the longest, offering a wondrous spectacle over the entire season surrounding the Summer Solstice. Angled perfectly to take in the rays of the sun during the two months of particularly lengthy daylight, before and after Summer Solstice, the roofbox diverts light inward to illuminate the opposite wall, gradually yet brilliantly. Because of a lack of written record, prehistoric Ireland remains something of a mystery as far as a cultural understanding is concerned. All scholars have to go on is what can survive: objects such as metal tools, jewelry, and decayed human remains are dominant artifacts examined for insight, but still leave many questions unanswered. 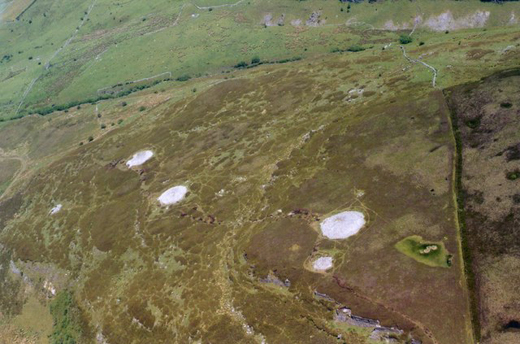 Ancient monuments like the Carrowkeel cairns are important pieces of the puzzle because they illustrate a new, essential aspect of daily life for the ancient Irish: their spiritual beliefs. The elaborate constructions, so carefully engineered to embrace their external environment, assert a strong sense of kinship with the natural world, and the early peoples’ gratitude to the land from which they carved out an existence. Archaeologists conjecture that Newgrange’s purpose was to embrace the arrival of warmer weather and fertile seasons. It is supposed to recognize that the worrisome months of shortening days and food supply and high risk of death are coming to an end, and express hope in the future after a long period of arduous strain. Carrowkeel, on the other hand, is reminiscent of a more jubilant celebration. For an early civilization that could depend on little more than crude technology and the cyclical change of seasons, the relief indulged in that less harsh, less painful period of midsummer must surely be worth trumpeting – or monument building, in this case. As a time of light, warmth, and fertility, summer provided a beautiful few months of relative safety for people who lived on the sharp edge of survival. Its painstaking engineering, representation of an ancient culture that is long dead, and the sheer dedication and effort required to make such a structure a reality make the Carrowkeel Cairns a site both interesting and evocative to the observer. So take a moment this week to reflect on these long, luxurious days of summer, and how we continue to celebrate them today.